Real Civilization Does Not Confuse Civilization and Superstition. Another day, another Jihadist attack aimed at children. The Islamist State has long given instructions to kill children. Twenty-two killed, 60 maimed in Manchester at a concert for children. A 22 year old cultural Libyan exploded himself. The “multicultural” assassin was technically, but not culturally, a Brit. Time to face reality. An eight year old little girl died, among others. Who is responsible? The savage who exploded himself, according to Islam, or those who, misleadingly, call Islam a “civilization”? Excited, nihilistic maniacs, or those who, in the philosophical establishment, call their religion civilized? Islam is not a civilization, it’s a superstition, and it has been highly successful precisely because this superstition gives a lot of pretexts to kill all sorts of people, while claiming warriors will be pals with god. Islam is not a civilization. How can we take seriously those who confuse “civilization” and superstition? Instead, indeed, Islam is just a superstition. And a pretty nihilistic one at that. “Nihil” means nothing in Latin, it’s related to annihilation. Muhammad explained from the beginning that Islam aimed at annihilating the Greco-Roman and Sassanid (Persian) empires. Islam orders that society and superstition should not be separated. Said otherwise, Islam orders society to become a “theocracy” (power of god). 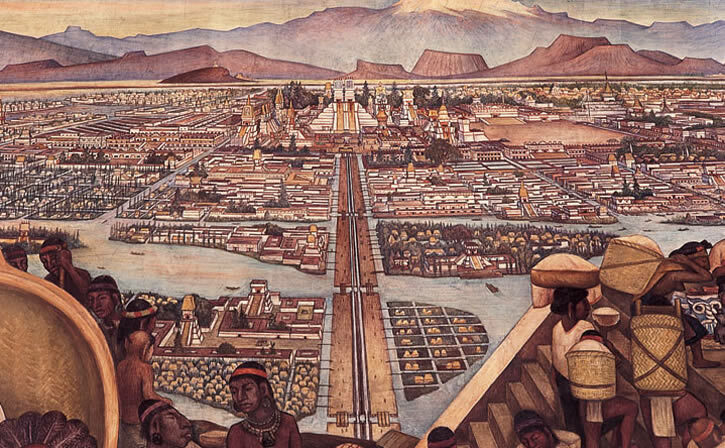 Tenochtitlan, Sixteenth Century. This is a civilization. It separated governance and superstition, because a civilization has to separate reality from fancy. This is primitive. Serious civilizations separated, and separate, superstition and political governance. In Japan the Shogun heading the government was no priest. Nor was the Chinese empire a theocracy. An even more enlightening civilization was the Mexican one. The (more or less central) Aztec government separated the religion and the government: the emperor had diverse titles (including “speaker”), but he had no religious title. The Aztec emperor was not a priest. The two top priests of Tenochtitlan were at the head of the Aztec Church, a completely distinct hierarchy from political governance (which comprised war, justice, commerce, finance). Make no mistake: I don’t mind the devil, if, and whenever, it serves civilization: for example, I do not condemn the massive bombing campaigns against the populations who had supported the mass murdering fascist regimes of Germany and Japan. It was the cheapest way, by a very long shot, cheapest not just economically and militarily, but also, overall, in human lives, to win the war. The Aztecs distinguished completely their superstitious religion from governance, That reflects, and encourages, the ability to distinguish reality from a fiction “above” it. Governance has to be grounded in reality, thus divorced from fiction. The “West” did this, and did it all along, under the Roman Republic. The separation of church and state was re-asserted formally when (all too Catholic!) emperor Justinian ordered a (“Pagan“!) law professor to head a commission to refurbish Roman Law (by then nearly 13 centuries old, and full of obsolete considerations). Justinian gave just one instruction: to separate secular from religious law. Justinian’s refurbished law was immediately made law in the empire of the Franks (Imperium Francorum), which held (most of) Western Europe. Thus, both Aztecs and Western Europe separated superstitious church and reality-based state. A real civilization does not confuse civilization and superstition. A civilization is the ultimate achievement of humanity. A superstition is a butterfly’s dream. And when a superstition is just a dressing for nihilism, it’s nothing to be proud of. Nothing. Not that nihilism is nothing, far from it. Where does nihilism comes from? Nihilism is a characteristic of human ethology. The greatest enemy of man is not just man, but the enormous destruction which man can bring to terrestrial ecology. Thus, the enemy of man is man, squared. Including oneself. To destroy that ecological destruction man brings, it’s best to destroy men. That’s where the nihilist instinct comes from. When there are more people than the ecology can stand, people have to die. Thus more so in the desert. Thus the nihilist essence of Islam! Thus the attachment of Islam to the regions with a difficult, unforgiving, ecology. The civil war in Syria followed a spectacular drought which starved Syrians massively. 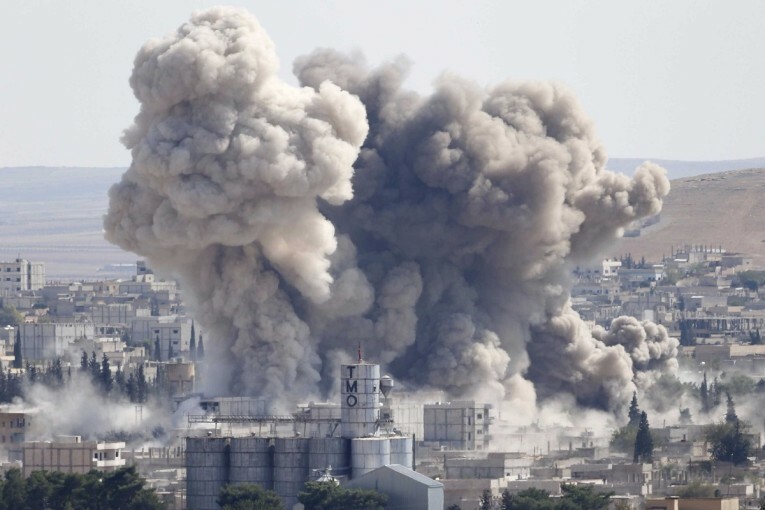 War in Syria has displaced at least 25% of the population, solving the ecological problem in a way few will find amusing, soon all over reproducing, if the greenhouse keeps on getting worse, as it will. Nihilism of Islamism: religions for a devastated and devastating future? 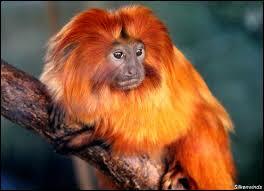 In 1984, a program of reintroduction of Golden Lion Tamarins brought nine of these heart melting primates from the Washington Zoo to a reserve to Brazil’s Mata Atlantica. At the time no more than 200 were left in the wild. However, Western zoos had their own populations, some dating several centuries (the cuties were popular at the French court). If Shakespeare Feels Life Is An Idiocy That Signifies Nothing, Does It Mean We Have To Die? Oder Arbeit Macht Frei? The brutality, witchcraft, lethal ambition, and madness of a play such as Shakespeare’s Macbeth leaves images, and phrases, ideas and moods which pervade the Anglo-Saxon universe, and what it influences, namely the rest of the world from New Delhi to Beijing, Tokyo, even Moscow. Who does not know “To be or not to be?”. It’s the opening sentence in Hamlet. The character is pondering suicide. Robin kindly explains that I am the idiot, by quoting me: “So on the eve of yet another disastrous day of tragedies, to read: “The more powerful we humans become, the more perfect our government has to be. Thus, the more We the Citizens have to be perfect. Thus, the keener we will have to be to find the truth, and impose it, when lives, or the future, are at stake.” made my blood curdle. Robin took a sentence from The Bard, and made it into an aphorism. I have several disagreements here, both with the method (Shakespeare did not talk about me, but about life), and with the aphorism itself. Shakespeare seems to believe that a tale told by an idiot signifies nothing. Quite the opposite. Idiots and madmen have much to tell, that’s the all idea of Shakespeare, come to think of it. I replied that Shakespeare here is in total contradiction, not just with humanism, but humanity itself. Humanity’s task is to give meaning to life. Shakespeare may have been an idiot full of sound and fury, like Hitler. As, indeed, the Nazis agreed fully with Shakespeare’s preceding quote. So they were destroyed by those who give meaning to life. May reciting Shakespeare literally be quite a bit like reciting the Qur’an literally? Modern law has started to discover that THOUGHT CRIME is a real problem (notwithstanding that it was made fun of by the fashionable Sci-Fi author, George Orwell). French and German law punish Nazi holocaust denial with prison. They have been imitated with a number of countries (including Hungary after 2010, where a would-be Nazi was since condemned to several years in prison suspended when he agreed to visit a number of sites where Nazis perpetrated holocausts, and to write a reports about what he learned after each visit). Is as bad as nihilism goes. For people like that why does killing children mean anything? Is it what they mean? Why not engage in various inanities and murders, then, to give life some spice, more meaning? Was then G.W. Bush’s presidency straight out of Shakespeare, fretting on a stage, heard of it no more, “a tale told by an idiot, full of sound and fury, signifying nothing”… In other words, was G. W. Bush’s presidency straight out of Shakespeare, something classical, natural, a normal way of behaving? Shakespeare is a double edge sword, and the handle itself is a blade too. By grabbing it, as if it were a well of wisdom, one cuts all tendrils of wisdom. Kudos to Obama for crying at the White House when evoking small children cut down by automatic weapons’ fire. And why were those small children killed inhumanely, tortured to death? Just because idiots telling furious tales, full of sound and madness, have decided life means nothing as long as it cannot be cut down by automatic fire. Reading Shakespeare, just as reading the Qur’an, should be done very carefully, under advanced philosophical supervision. Lest it feeds the idiots with the mood that life signifies nothing, and thus may as well be welcome as a tale told by an idiot (Hitler, or some other “Prophet”? ), full of sound and fury. Wisdom is not just blossoming with sophisticated ideas, it also avoids reeking of foul, dangerous, sadistic, cruel, nihilistic, vicious moods. DEVALUATING TO DEATH IS NO PANACEA. Overview: The USA has used a devaluation of the US Dollar to help the US economy by increasing exports. This is an attempt to rob Jeanne (d’Arc) to feed (Uncle) Sam, and the exact sort of attempt to claw out some unfair advantage, that ignited the Great Depression that led to World War Two. This is not just injust and immoral, it’s grotesque, immoral, and very dangerous. Instead the USA should proceed with its long delayed drastic economic overhaul. Currency devaluation to gain a short term economic advantage leads to political, social and moral devaluations. Ultimately it is the most guaranteed path to fascism and war, and defeat, history is very clear on that, all the way back to Rome. The USA cannot use its old devaluation trick to re-launch its economy anymore, because the rise of the rest of the world, and, in particular, of the colossal European Union, has deprived it of its special status. Obama is now talking about (part of) this, and it’s excellent news. Putting the US back on track involves first a rise of the Dollar, and since that’s done with the mouth, and a few clicks of the mouse, it can be done right away. A lot of the rise of commodity prices, measured in dollars, has been caused by the devaluation of the US Dollar. In the last eight years, as oil went from 20 to 150 in US Dollars, the relative rise in Euros was only half of that. As Barack Obama puts it:.”If we had a strengthening of the dollar, that would help” reduce fuel costs, (he said, according to Reuters). Instead, Fed Officials and the Bush administration blame high commodity prices on supply and demand, despite falling demand due to slower global growth. Meanwhile, they pursued what the Wall Street Journal calls “their destructive and all but explicit dollar devaluation strategy” (WSJ, August 8, 2008). 1) In the very first stage, other countries get irritated because they then sell less of their own products, lowering their own activity, making them lose long term market share to X, etc. 2) Simultaneously, inflation of imports inside X is proportional to the lowering of the currency of X. This is what is happening to the US right now with oil and commodities. The lowering of the currency of X can lead foreigners to not invest in X as much as they should, because they wonder where it will stop (the USA is at this stage where foreigners are starting to pull away). 3) In the preceding stage, if the rise of exports’ worth does not keep pace with the rise of imports’ cost, the situation of X can get worse (this is not yet the case in the USA presently: the trade imbalance is going down). That stage is often facilitated if other countries take, in response to (1), corrective measures, not to say outright retorsion. Should the rise of exports not keep pace, other countries and investors lose trust in X’s currency, and, in a first stage, pull their investments out, making a bad situation way worse (the USA is approaching this stage: the big European countries receive much more Foreign Direct Investment than the USA, increasing the gap; the UK gets about three times more FDI, relative to its population). 4) In the final stage, X becomes so cheap, foreigners swoop in, and exert undue influence (this happened to imperial Rome, just before it transmogrified itself into a fascist “Catholic Orthodox” theocracy: it was easier to teach the rudiments of civilization to barbarians through a superstitious religion, than by sending them to school). Competitive devaluations are therefore economically destabilizing and lead to civil unrest, fascism, and war. The textbook examples are the Weimar Republic and Argentina in the twentieth century. Britain, France, and many Mediterranean countries used competitive devaluations on a regular basis, creating havoc. Meanwhile Germany, (remembering that after using a massive devaluation to annoy France in the early twenties, she ended up with Nazism), became obsessed, come what may, to insure the value of the Deutsch Mark. The result was a flourishing economy, and that strategy was so good, it was even adopted by France within a generation, resulting ultimately in the creation of the Euro (after the Franc and the Mark got locked together for a decade, one may as well have called them the same, indeed). This is not the first time the USA indulges in a competitive devaluation. In the past, though, the US Dollar was the world’s one and only reserve currency. So, when the US Dollar was going down, US exports would become cheaper, but payments of oil and commodities would not go higher (because they were all in US Dollars). The USA could engage in competitive devaluation without punishment, so it did. Now, for the first time, it’s being punished. When Saddam Hussein decided unwisely to switch to oil payments in Euros, the USA replied by invading and destroying Iraq. That method, though, cannot be duplicated easily. Many countries are now switching to Euros, and when oil and commodities have prices in Euros, as the US Dollar goes down, their prices in Dollars go up. The USA is now approaching the sort of infernal descent into an inflationary spiral Argentina was destroyed with, nearly a century ago. The only saving grace is that the US debt to foreigners is, so far, in US Dollars (so it goes down with the Dollar; Argentina had a lot of its debt in foreign currency). Barack Obama is right to call for a rise of the US Dollar. When the Euro was created, its value was found by looking at the long term average of the French Franc relative to the US Dollar over a century (around 6.66 Francs for a Dollar). That fixed the Euro-Dollar parity, and we are presently more than 50% above it. The present imbalance has been caused by deliberate short term neglect of the Dollar and US economy, and long term erroneous civilizational strategies. A correct US administration would point out that this is over, and that the US Dollar will regain its correct value right away. The turn around will be signaled by turning the Dollar around. This can be done tomorrow morning: the European Central Bank will be delighted to have an opportunity to ambush the speculators, it has been chomping at the bit, and is tired to intervene alone). This would bring capital in the USA immediately, helping to reverse the part of its economic decline which is caused by a dearth of modern investments. Whereas, if the present situation perdures, it would do so because of the persistence of disastrous economic policies inside the USA, and the failure to even talk as if one wanted to turn things around. Ultimately, a catastrophic loss of control over the US currency could occur if a clear signal does not come that US authorities have decided to stop the decay of their country. Not a good way to go. Remember Argentina.